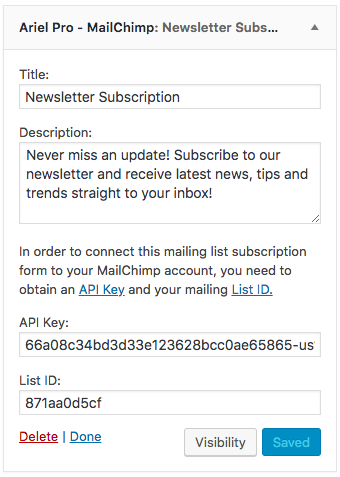 Ariel Pro includes MailChimp integration (newsletter subscription form) built right in! With Ariel Pro, it's easy to create a newsletter subscription box, as it comes in a built-in widget. You can put the Ariel Pro - MailChimp widget in any widget area, for example on the sidebar or in a footer column. Sign up for MailChimp, or log into your account. You will also need to either create a new list or or get the list ID of a current list that you'd like to use. For more details, read the instructions here. Now drag the ArielPro - MailChimp widget in any sidebar or footer area. You can provide a custom title and description to the form. 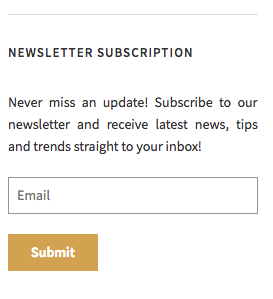 Save the widget - it will create a nicely formatted subscription form on the website.